With much excitement, J. Devlin Glass Art’s founder and artist Kathy Gustafson is unveiling a new line of glass gifts at the 2014 winter trade shows. Kathy is using a popular glass art technique called fused glass to unleash a series of “critters” like none you’ve seen before. These fused glass critters are curious, cute, and sophisticated, all wrapped up into one. When asked why create fused glass “critters,” Kathy admits, “it was for my own personal enjoyment!” And when you see them, you’ll know why! These brightly colored critters are surprisingly playful, catering to inquisitive minds—and yet they are tasteful with an air of elegance. Styles range from fanciful winged critters such as butterflies, dragonflies, bees, and ladybugs to earthly turtles, snails, lobsters, and bugs. 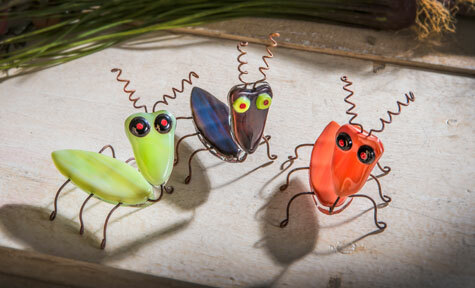 Fused glass critters add interest to spring and summer décor and nature-based themes. They add a splash of color and originality to desks, mantles, bookcases, and end tables. Fused glass is the process of putting two or more pieces of glass into a kiln and heating them until they are fused together into a single piece. A technique that is quickly gaining popularity in the world of fine art, fused glass is different than stained glass because it has no lead lines. While J. Devlin Glass Art has a wide variety of textured and stained glass gifts such as glass jewelry boxes, glass photo frames, and stained glass lamps, this is the first series of glass gifts using fused glass. Watch for more fused glass gifts to supplement these creative critters in the future! Fused glass critters are very affordable and can be purchased wholesale through the J. Devlin Glass Art website. For more information or to become a J. Devlin Glass Art retailer, contact us at (402) 465-8100 or submit your request using our online form. 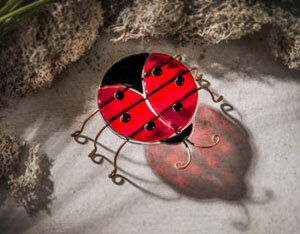 All J. Devlin Glass Art products are made from lead-free solder to protect you and the environment.